For other uses, see Vermilion (disambiguation). The Venetian painter Titian used vermilion for dramatic effect. 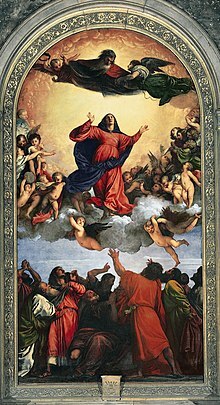 In the Assumption of the Virgin (1516–18) the vermilion robes draw the eye to the main characters. The word vermilion came from the Old French word vermeillon, which was derived from vermeil, from the Latin vermiculus, the diminutive of the Latin word vermis, or worm. The name originated because it had a similar color to the natural red dye made from an insect, the Kermes vermilio, which was widely used in Europe. The first recorded use of vermilion as a color name in English was in 1289. The term cinnabar was used interchangeably with vermilion until the 17th century, when vermilion became the more common name. By the late 18th century 'cinnabar' applied to the unground natural mineral only. In some Iberian languages the word for "red" is also derived from vermiculus, making the words for "red" and "vermillion" doublets. Compare Portuguese vermelho ("red") and vermelhão ("vermillion"). Vermilion is a dense, opaque pigment with a clear, brilliant hue. 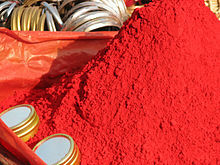 The pigment was originally made by grinding a powder of cinnabar (mercury sulfide). Like most mercury compounds, it is toxic. Vermilion is not one specific hue; mercuric sulfides make a range of warm hues, from bright orange-red to a duller reddish-purple that resembles fresh duck liver. Differences in hue are caused by the size of the ground particles of pigment. Larger crystals produce duller and less-orange hue. Cinnabar pigment was a side-product of the mining of mercury, and mining cinnabar was difficult, expensive and dangerous, because of the toxicity of mercury. The Greek philosopher Theophrastus of Eresus (371–286 BC) described the process in "De Lapidibus", the first scientific book on minerals. Efforts began early to find a better way to make the pigment. The Chinese were probably the first to make a synthetic vermilion as early as the 4th century BC. The Greek alchemist Zosimus of Panopolis (Third–Fourth century AD) wrote that such a method existed. In the early ninth century the process was accurately described by the Persian alchemist Jabir ibn Hayyan (722–804) in his book of recipes of colors, and the process began to be widely used in Europe. The process described by Jabir ibn Hayyan was fairly simple. Mercury and sulfur were mixed together, forming a black compound of sulphide of mercury, called Aethiopes mineralis. This was then heated in a flask. The compound vaporized, and recondensed in the top of the flask. The flask was broken, the vermilion was taken out, and it was ground. When first created the pigment was almost black, but as it was ground the red color appeared. The longer the color was ground, the finer the color became. The Italian Renaissance artist Cennino Cennini wrote: "if you were to grind it every day even for twenty years it would keep getting better and more perfect." During the 17th century a new method of making the pigment was introduced, known as the 'Dutch' method. Mercury and melted sulfur were mashed to make black mercury sulfide, then heated in a retort, producing vapors condensing as a bright, red mercury sulfide. To remove the sulfur these crystals were treated with a strong alkali, washed and finally ground under water to yield the commercial powder form of pigment. The pigment is still made today by essentially the same process. Vermilion has one important defect: it is liable to darken, or develop a purplish-gray surface sheen. Cennino Cennini wrote, "Bear in mind ... that it is not in its character to be exposed to air but it is more resistant on panel than on walls since, when it is used and laid on a wall, over a period of time, standing in the air, it turns black." Newer research indicates that chlorine ions and light may aid in decomposing vermilion into elemental mercury, which is black in finely dispersed form. Vermilion was the primary red pigment used by European painters from the Renaissance until the 20th century. However, because of its cost and toxicity, it was almost entirely replaced by a new synthetic pigment, cadmium red, in the 20th century. Genuine vermilion pigment today comes mostly from China; it is a synthetic mercuric sulfide, labeled on paint tubes as PR-106 (Red Pigment 106). The synthetic pigment is of higher quality than vermilion made from ground cinnabar, which has many impurities. The pigment is very toxic, and should be used with great care. Vermilion pigment, traditionally derived from cinnabar. Vermilion has the defect of darkening with time. The bridle of the horse in The Battle of San Romano by Paolo Uccello in the National Gallery in London has turned from red to dark brown. The first documented use of vermilion pigment, made with ground cinnabar, dates to 8000–7000 BC, and was found at the neolithic village of Catalhoyuk, in modern-day Turkey. Cinnabar was mined in Spain beginning in about 5300 BC. In China, the first documented use of Cinnabar as a pigment was by the Yangshao culture (5000–4000 BC), where it was used to paint ceramics, to cover the walls and floors of rooms, and for ritual ceremonies. In Rome, the precious pigment was used to paint frescoes, decorate statues, and even as a cosmetic. In Roman triumphs, the victors had their faces covered with vermilion powder, and the face of Jupiter on the Capitoline Hill was also colored vermilion. Cinnabar was used to paint the walls of some of the most luxurious villas in Pompeii, including the Villa of the Mysteries. Pliny reported that the painters of that villa stole a large portion of the expensive pigment by frequently washing their brushes and saving the wash water. In the Byzantine Empire, the use of cinnabar and the vermilion color was reserved for the use of the Imperial family and administrators; official letters and imperial decrees were written in vermilion ink, made with cinnabar. Vermilion was also used by the peoples of North and South America, to paint ceramics, figurines, murals, and for the decoration of burials. It was used in the Chavin Civilization (400 BC – 200 AD), and in the Maya, Sican, Moche, and Inca Empire. The major source was the Huancavelica mine in the Andes mountains in central Peru. The most dramatic example of the use of vermilion in the Americas was the so-called Tomb of the Red Queen, located in Temple XIII in the ruins of the Mayan city of Palenque in Chiapas, Mexico, dated to between 600–700 AD, discovered in 1994 by Mexican archeologist Arnoldo Gonzales Cruz. The body and all the objects in the sarcophagus were covered with bright red vermilion powder made from cinnabar. The technique for making a synthetic vermilion by combining sulphur and mercury was in use in Europe in the 9th century, but the pigment was still expensive. Since it was almost as expensive as gold leaf, it was used only in the most important decoration of illuminated manuscripts, while the less expensive minium, made with red lead, was used for the red letters and symbols in the text. this pigment is made by alchemy, prepared in a retort, which subject I will leave be since to put every method and recipe into my discussion would be too longwinded. The reason? Because if you care to take the trouble you will find a lot of recipes for it, and particularly if you cultivate friendships with monks. But, so that you do not waste your time with the many different techniques, I advise you, just take what you can find at the apothecary's for your money. And I want to teach you how to buy it and how to recognise the good vermilion. Always buy solid vermilion and not crushed or ground. The reason? Because more often than not you are cheated either with red lead or crushed brick. By the 20th century, the cost and toxicity of vermilion led to its gradually being replaced by synthetic pigments, particularly cadmium red, which had a comparable color and opacity. 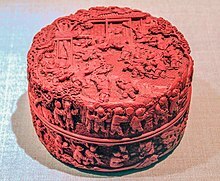 The first documented use of cinnabar, or vermilion, for decorating pottery in China dates to the Yangshao culture (5000–4000 BC). This bowl is from Banpo Village, Shaanxi, China. The Villa of the Mysteries in Pompeii was a showcase for the expensive vermilion pigment made from ground cinnabar. The walls of the tombs of Maya rulers were sometimes painted with cinnabar, and in the Tomb of the Red Queen in Palenque (600–700 AD), the remains of a noblewoman were covered with bright vermilion cinnabar powder. The lacquer came from the Chinese lacquer tree, or Toxicodendron vernicifluum, a relative of the sumac tree, which grew in regions of China, Korea and Japan. The sap or resin of the tree, called urushiol, was caustic and toxic (it contained the same chemical compound as poison ivy) but, painted on to wood or metal, it hardened into a fine natural plastic, or lacquer surface. The pure sap was dark brown, but beginning in about the 3rd century BC, during the Han Dynasty, Chinese artisans colored it with powdered cinnabar or with red ochre (ferric oxide), giving it an orange-red color. Beginning in about the 8th century, Chinese chemists began making synthetic vermilion from mercury and sulfur, which reduced the price of the pigment and allowed the production of Chinese lacquerware on a larger scale. The shade of red of the lacquerware has changed over the centuries. During the Eastern Han Dynasty (25–220 AD) the Chinese word for red referred to a light red. However, during the Tang Dynasty (618–907), when the synthetic vermilion was introduced, that color became darker and richer. The poet Bai Juyi (772–846) wrote that "the flowers in the river when the sun rises are redder than flames", and the word he used for red was the word for vermilion, or Chinese red. When Chinese lacquerware and the ground cinnabar used to color it were exported to Europe in the 17th and 18th centuries, European collectors considered it to be finer than the European vermilion. In 1835 "Chinese vermilion" was described as a cinnabar so pure that it only had to be ground into powder to become a perfect vermilion. Historically European vermilion often included adulterants including brick, orpiment, iron oxide, Persian red, iodine scarlet—and minium (red lead), an inexpensive and bright but fugitive lead-oxide pigment. In China from ancient times, vermilion was regarded as the color of blood, and thus the color of life. It was used to paint temples, the carriages of the Emperor, and as the printing paste for personal seals. It was also used for unique red calligraphic ink reserved for Emperors. Chinese Taoists associated vermilion with eternity. The main gate of the Forbidden City in Beiljing is painted vermilion or Chinese red. The bright vermilion murals in the Villa of Mysteries in Pompeii (before 79 AD) were painted with ground and powdered cinnabar, the most expensive red pigment of the time. The painting of Saint Jerome by Masaccio (1428–29) featured a vivid robe painted with vermilion. A page of the Roman de Girart de Roussillon (1450). Both vermilion and minium, or red lead, were used in Medieval manuscripts. Vermilion, as expensive as gilding, was usually reserved for the most important illustrations or designs. Hindu women use vermilion along the hair parting line known as Sindoor, to signify that they are married. Hindu men and women often wear vermilion on their forehead during religious ceremonies and festivals. The Shaolin temple, where the Buddhist monk Bodhidharma is reputed to have established the new sect of Chan Buddhism (Zen Buddhism), is colored a bright tone of vermilion. This temple was featured in the West by the 1972–1975 TV series Kung Fu. The Vermilion rose is a symbol of the Blessed Virgin Mary. In Han China's Five Elements cosmology (cf. Chinese mythology), one of the four symbols of the four directions is a bird called Vermilion Bird, which represents the direction of south. The color red (particularly as exemplified by cinnabar/vermilion) was also symbolically associated with summer, fire, a certain note on the musical scale, a certain day of the calendar, and so on. Vermilion Sands is a collection of science fiction short stories by J.G. Ballard published in 1971 about an imaginary future resort that pleases its guests by using various kinds of futuristic technology. Manfred, Lord Byron. "With the azure and vermillion / which is mixed for my pavillion"
Vermilion City is one of the locations used in the English translated versions of the Pokémon video games and anime. It is a port town in the Kanto area and the name is derived from the original Japanese name クチバシティ (Kuchiba City). Kuchiba is an orange-red color associated with sunsets and autumnal leaves and "Vermilion" was used as an approximate translation. "Red-orange" redirects here. For the variety of orange fruit, see red orange. At right is displayed the Crayola color red-orange. Red-orange has been a Crayola color since 1930. Displayed at right is the web color orange-red. It was formulated in 1987 as one of the X11 colors, which became known as the X11 web colors after the invention of the World Wide Web in 1991. At right is the medium tone of vermilion called "vermilion" on the Plochere color list, a color list formulated in 1948 that is used widely by interior designers. "China red" or "Chinese red" is the name used for the vermilion shade used in Chinese lacquerware. One version is shown in the color box at right; the shade could vary from dark to light depending upon how the pigment was made and how the lacquer was applied. Chinese red was originally made from the powdered mineral cinnabar, but beginning in about the 8th century it was made more commonly by a chemical process combining mercury and sulphur. Vermilion has significance in Taoist culture, and is regarded as the color of life and eternity. The first recorded use of Chinese red as a color name in English was in 1924. The source of this color is: ISCC-NBS Dictionary of Color Names (1955)--Color Sample of Chinese red (color sample #36). ^ "Vermilion". Merriam-Webster. 21 May 2018. Retrieved 16 June 2018. ^ Shorter Oxford English Dictionary (2002), 5th Edition, Oxford University Press. ^ Cox, Robert E. (2009). The elixir of immortality: A modern-day alchemist's discovery of the philosopher's stone. Rochester: Inner Traditions. pp. 22–23. ISBN 978-1-59477-303-7. ^ a b c d David Bomford and Ashok Roy, A Closer look: Colour. p. 41. ^ Lara Broecke, Cennino Cennini's Il Libro dell'Arte a New English Translation and Commentary with Italian Transcription, Archetype 2015, p. 64. ^ Gettens, Rutherford J.; Stout, George L. (1966). Painting Materials: A Short Encyclopedia. Courier Dover Publications. p. 171. ISBN 0-486-21597-0. ^ Lara Broecke, Cennino Cennini's Il Libro dell'Arte: a New English Translation and Commentary with Italian Transcription, Archetype 2015, p. 64. ^ "Which Ancient People Used Mercury as a Dye?". ThoughtCo. Retrieved 2018-02-04. ^ Daniel V. Thompson, The Materials and Techniques of Medieval Painting, p. 103. ^ Lara Broecke, Cennino Cennini's Il Libro dell' Arte: a new English Translation and Commentary with Italian Transcription, Archetype 2015, pp. 63–4. ^ Garner, H., "Technical Studies of Oriental Lacquer"; Studies in Conservation (8), (1963) pp. 84–97. ^ Ken Johnson, "Cinnabar: Zen once came in a shade of red," New York Times, August 20, 2009. ^ Yan Chunling, Chinese Red, Foreign Languages Press, Beijing, (2008). Varichon, Anne (2005). Couleurs: Pigments et teintures dans les mains des peuples. Paris. ISBN 978-2-02-084697-4. Yan, Chunling (2008). Chinese Red. Beijing: Foreign Language Press. ISBN 978-7-119-04531-3. Ball, Philip (2001). Bright Earth: Art and Invention of Colour. Hazan (French translation). ISBN 978-2-7541-0503-3. Eastaugh, Nicholas (2004). Pigment Compendium: A Dictionary of Historical Pigments. Butterworth-Heinemann. ISBN 0-7506-5749-9. "Vermilion". Pigments through the Ages. WebExhibits. "Vermilion" . New International Encyclopedia. 1905.